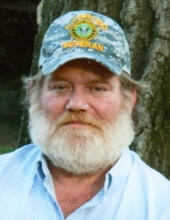 Winnebago – John Francis Updegraff, 58, of Winnebago, passed away peacefully, Monday, November 19, 2018 at home surrounded by his loving family. Born April 2, 1960 in Williamsport, PA, the son of Arthur Lee and Phyllis Jean (Gephart) Updegraff. He graduated from Canton High School in Canton, PA in 1978. John served with pride and dignity in the United States Army beginning on June 28, 1978 where he was an artillery and wheel vehicle repairer and was awarded several service decorations including a good conduct medal, overseas service ribbon and a driver and mechanic’s badge. He was honorably discharged on June 27, 1989 following a military service injury. He was a sergeant in the CO D 75th CS BN and a proud member of the Black Sheep Squadron. After serving in the Army John was a self-employed truck driver. John married Nancy Ann Howell on July 19, 1997 at Rock Run Long Rifles Gun Club in Burritt Township. He was an avid hunter and fisherman, taught hunter safety and served on the National Rifle Association as a Range Safety Officer. A member of Beloit Rifle Club, Rock Run Long Rifles Gun Club, North American Hunting Club and a life-member of the National Rifle Association. Also a member of the Roscoe VFW Post 2955 Auxiliary, Disabled American Veterans and a life-member of the American Legion. He enjoyed modern and primitive camping and teaching children about United States history and lifestyle through living history events in the Midwest. John is survived by his wife, Nancy Updegraff of Winnebago; sister, Kathy (Tom) Campbell; brother-in-law, Jeffrey (Lynne) Howell; stepsons, Robert (Tammy) Bonnel, Eric (Meghan) Pollard, Jason Pollard; step-grandchildren, LeRoy Bonell, Addison Pollard, Caroline Pollard; numerous nephews and nieces; special family of the heart, brothers, Steve Preston, Robert Hill; sister, Jean Carlson; special friend and neighbor John Carrat and his family; John’s “kids” Mia , Belle and Brandy who is again with her dad. John is predeceased by his parents, Arthur and Phyllis Updegraff; brothers, Thomas Updegraff, Danny Updegraff; step-father, Hermann Atherton-Ely; parents-in-law, Ronald and Florence Howell; parents of the heart, John and Leatha Preston. Funeral service 6:00 p.m. Wednesday, November 28, 2018, with a visitation starting at 4:00 p.m., at Genandt Funeral Home, 602 N. Elida St., Winnebago with Pastor Tim Spickler of New Life Bible Church near Winnebago officiating. Cremation rites to follow the funeral service. In lieu of flowers a memorial will be established. For an online obituary and tributes go to www.genandtfuneralhome.com. With United States Army funeral honors. Cremation rites to follow the funeral service. "Email Address" would like to share the life celebration of John Francis Updegraff. Click on the "link" to go to share a favorite memory or leave a condolence message for the family.